DeAnna Bennett is hungry. She wants to be the best fighter that she possibly can be, and she’s well on her way to that goal. 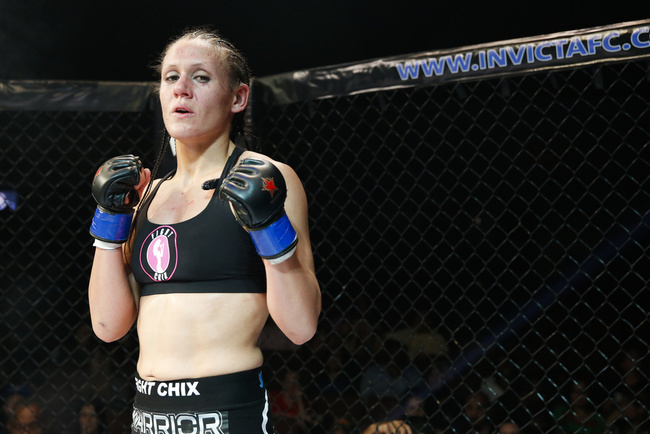 Since making her pro MMA debut in February of 2012, the 30 year old rising star has been plowing her way her opponents, earning a perfect 6-0 record, with two of those wins coming by TKO and two more by decision. She set Invicta FC’s Flyweight Division on fire when she bested a returning Michelle Ould with devastating body blows at Invicta 8 last September, and sparked talk of a title shot when she defeated her fellow contender, Jennifer Maia, by unanimous decision at Invicta 10 in December. But DeAnna Bennett is also quite literally hungry right now. The fighter, who is set to make her Strawweight debut against Norma Rueda Center at Invicta 11 this Friday, February 27, is nearing the end of her first ever weight cut to 115 lbs. Even though the cut is going as well as possible, thanks to the help of her nutritionist and her team at the Pit Elevated Fight Club in Utah, the avid eater really misses the pleasures of food beyond her current diet. And she doesn’t always handle hunger particularly well. We managed to talk to The Argentine Assassin about her decision to drop to Strawweight, her plans for Rueda Center, and her unfinished business with Julianna Pena without a single hunger-related face melting. And she answered all of our questions with only the tiniest food-deprived slip at the end. Most weight class changes come at turning points in a fighter’s career. Either they’ve run out of people to face in their current division, they’re working their way out of a slump, or they want to face someone specifically in another class. But you’re undefeated, you were well on your way to a shot at Barb Honchak’s and her belt at Flyweight, so what made you decide to drop to Strawweight? You know, I definitely would have loved that fight with Barb. It would have been a great fight, she’s a tough opponent. But it wasn’t anything with the opponents or anything there. I just started working with a nutritionist for performance wise because I want to take every angle I can to be the best fighter possible. So I started doing that and I found that by eating healthy and following kind of that kind of diet, I was actually sitting lower than I used to cut water weight from to get down to weight. I want to be the best fighter I can possibly be, where I am going to peak the most, and so I figured I’d rather be a large Strawweight than be a really small Flyweight. In the past, you’ve mentioned that the UFC is a long term goal for you. Did their robust w division influence your decision at all? If that’s in the cards for me for the future, then I’d definitely not pass up that opportunity. I’m really happy and I love being able to fight for Invicta. They’re a great organization. The best girls that are out there are there in the UFC, so I would love to have an opportunity to fight because I want to be the best. I want to fight the best and push myself, so if that happens for me, then I would love it. Would you be open to returning to Flyweight in the future? Yeah. If the opportunity came up and it was something that I talked to my manager and my coaches about, then I would have no problems with that. Like I said, the fight with Barb was something that I had in my mind and was focused on for a really long time and wanted to get there. So if the cards were right, then yeah. I’d be open to it. You were originally slated to face Lynn Alvarez at Invicta 11, but she had to drop out due to injury earlier this month. Norma Rueda Center has stepped up to take her place. Has that changed anything about your preparation for the fight? They’re definitely different style fighters. A lot of people want to tailor what they do specifically to a fighter, but I just try and be the most well-rounded, try and be the best fighter that I can. Obviously there’s little tweaks that you want to do, little things that you want to look out for. But my training mostly has just been pretty much the same: trying to work on every aspect that you can. Both you and Rueda Center wrestled in high school. She also wrestled at the collegiate level. You’re both very strong on the ground. Her striking is still improving. What do you think we can expect from this fight? It’s definitely going to be a tough fight. I’m really excited. You get the wrestlers, they want to get in there and they want to grind it out. I can’t tell you exactly where the fight’s going to go, but either way, she’s going to be tough and it’s going to be a war out there. Your last fight when you defeated Jennifer Maia at Invicta 10, was a war, too. She’s only the second fighter ever to last three rounds with you, and all three rounds were intense and relatively close. It might have been your biggest challenge yet. What did you learn from that fight? It definitely was the toughest fight that I’ve had and I learned a lot from that fight. She’s a really tough fighter, but when I came into the fight, I fell into what she wanted to do. I fought her fight and I didn’t fight my fight, which is probably my biggest regret about that. I took a lot out of that, just focusing on what I do and implementing my game plan in fights instead of just going on with what my opponent wants to do and so. It’s going to be a different case with this fight. I’ve learned a lot from the last one, and I know what I can do better for this one. The only other woman to last three rounds with your was Julianna Pena. You won that fight by unanimous decision, but you’ve said that you’d like to face her again because you don’t feel that you were at the top of your game for that fight. Is this what you have to do when you’re an undefeated fighter: fixate on the wins that weren’t perfect enough? Oh yeah. Probably the Maia fight and then that fight, I always have those fresh in my mind. I think about what I could have done and everything. My coach literally had to be like “DeAnna. Snap out of it. You won. You learn from it. You’re fine,” because when I go out there and I don’t perform how I want to and what I feel like is my very best, then I take it almost as if it were a loss, I guess. I want to be the very best possible, so I find what I can do better and work on that in the gym so that that doesn’t happen again. Do you still want to redeem yourself against Pena? What about Maia? If they came up, I would love to fight Pena again. It probably wouldn’t happen, because she’s in a much bigger weight class now, but I would love that opportunity, because I know there was a little bit of talk after that fight. I know she’s had a lot of articles talking about how she wishes she could fight me again because she knows that she would win this time around, but I feel the same way. So I would definitely be open to it, even if it did mean going into a higher weight class. Before you wrestled in high school, you were on the water polo team. That sport scares me because it seems so tough and intense. Is there anything from that experience that you’ve been able to use in your career as a fighter? It was definitely a tough sport. In a lot of places, people who don’t have water polo don’t really see how exhausting and tough it is. We had a new team at our school and we had some people who played almost the entire game. I actually ended up punching a girl in the middle of one of my games in high school. So yeah, I try to take that into this, I guess. (laughs) But just being mentally tough and having the endurance and strength to keep going, that’s something that I take into every sport that I’ve ever played. You mentioned that you were a pretty big Star Wars fan in 13 Things You Didn’t Know About DeAnna Bennett. Who would win in a lightsaber battle between you and Roxanne Modafferi? Oh man. I think I’m going to have to concede this one to her because the force is strong with that one. I’d put up a heck of a fight here, but I think she would best me at that one. Is there anything else you’d like to add before I let you go? That’s a very good question. If I wasn’t food deprived, I might have a good answer for that but I might not. I just always want to thank my team and thank my coaches. I wouldn’t be out there without them. And pretty much anyone who puts up with me when I’m weight cutting, which is A+ in my book because I get pretty mean. I’ve got to thank them and all of them and all of my sponsors as well. I couldn’t do what I do without every single one of them and everyone that puts up with me.